For those just getting into Fiber Optic we have a few Kits that will be more then helpful in teaching you the basics of Fiber lighting. The FS1 Sample Pack contains: 3 ft of .25mm, .55mm, .75mm, 1mm & 2mm Unjacketed fiber. 6" of our SGS7 Sideglow cable, 1 ft of the EG25 Endglow cable, 1 ft of LG5-32, 1 ft of LG64, 1 ft of E1000 Simplex,6" of our R1000 Fluorescent Fiber, and Polishing Films and instructions. Perfect for those that are not sure what fiber is best for their project. 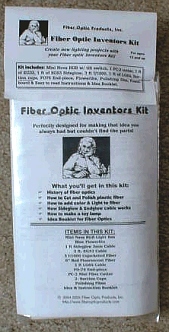 Our Fiber Optic Inventors Kit comes with all you'll need to start Inventing Ideas with Fiber Optics. Kit includes with 1 ft of EG32 Endglow cable, 1 ft of SGS4 Side glow Cable, 3 ft of U1000 fiber, FO-75 End-piece, Push-Pin, Foam Core, Mini Colored LED light, PC-2 Cutter, Suction cups, Polishing Films, & Instructions. This kit ships priority mail !! The FSK-2 has all you'll need for learning how to cut , splice, and connect 1mm plastic fiber to AMP components. 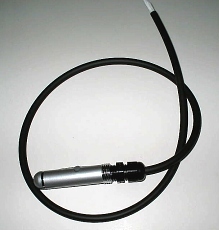 You get 8 ft of our E1000 Simplex Cable, 1 Pocket Cutter, DNP AMP Connectors: 43-1, 42-1, 46-1, 87-1, & 51-1. 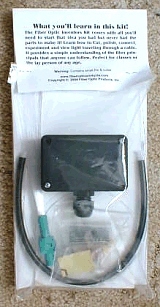 1- LED Red/Blue Flasher, Polishing Films, and Instructions. Simple inexpensive kit for all ages! 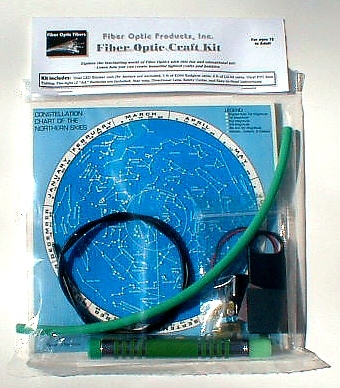 Ok now for the crafters comes the Fiber Craft Kit, this Kit comes with all you need to get started lighting your Clothes, Models, Hats, Flowers and more. Perfect the beginning hobbyist. Kit comes with 1 Dual LED Blinker with R/B (9v battery not included), 1 ft of EG50 Endglow cable, Tubing, 2 ft of LG62, Penlight & Boot, Directional Lens, Foam Star Map, and easy to read instructions for ages 10 to 80 !! A must for every one wishing to learn how our Fiber Optic Lines work. 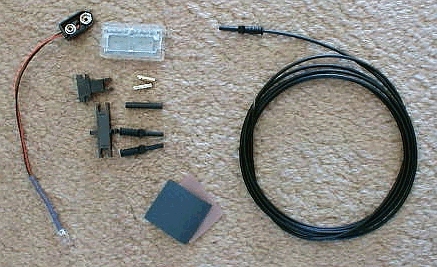 This Kit comes with Voice Emitter and Receiver. You solder parts to board and learn how your voice is transmitted to light signals and back again to sound. Buy 2 and create a intercom system. Fun for ages 12 and up! 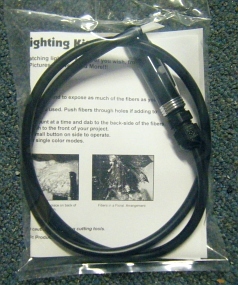 The Newest new Lighting Kit developed by Fiber Optic Products, inc. is NOW Here !!! You asked for it and we produced it! 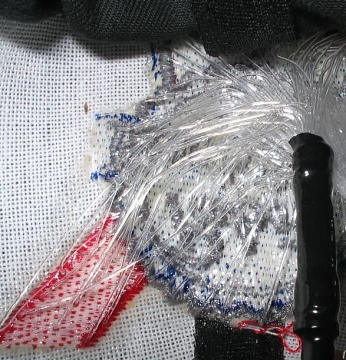 Now you can add fiber Optic to your Hat, Coat, Clothing, Models, Floral Arrangements, or anything your wish. 3.) Simple to read instructions. 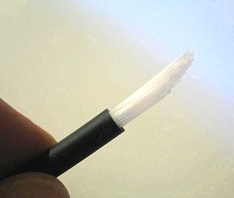 Cut Fiber cable to length, insert in cloth or other material, add epoxy to hold fibers, and Light'er up! 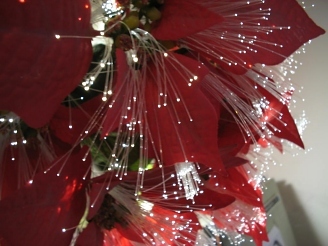 Copyright © 1998-2013 Fiber Optic Products, Inc.